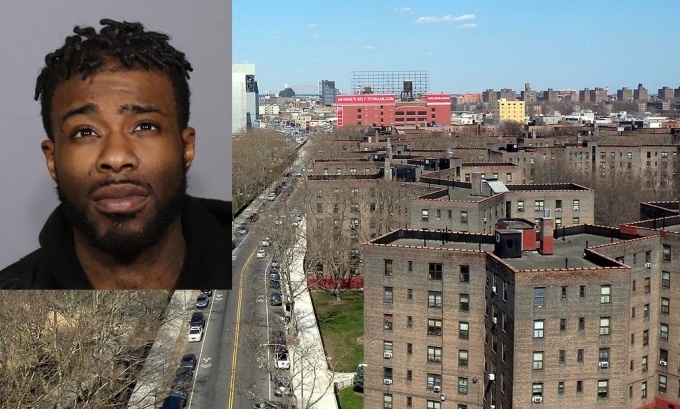 The police are looking for a man who allegedly fired several shots while entering an apartment building at the Queensbridge Houses complex last week. The suspect, identified as 26-year-old Johnathan Faison, allegedly fired multiple shots upon entering 41-02 12th St. at around 10:30 p.m. on Wednesday, Jan. 16, police said. Faison allegedly left the building following the shooting with his firearm on display. No one was hurt as a result of the incident. Anyone with information on Faison’s whereabouts should contact the Crime Stoppers hotline at 1-800-577-8477, or text CRIMES and then enter TIP577, or visit www.nypdcrimestoppers.com. These lowlife mutts are more likely now to carry illegal weapons than before when we had a good stop and frisk policy.thos is what happens when liberal mayors force police commissioners to be there lap dog and go easy on criminals. The good news is that unemployment in NYC is at a record low of 4%. The bad news is that lowlifes like this guy will still commit crime instead of getting a job. I grew up in Ravenswood in the late 1950’s early 1970’s and Queensbridge always had violence going on. It’s sad that all of the people that have moved in since don’t do anything to try and change it and kids that grew up there are probably the ones committing the violent acts against their friends and neighbors. This guy looks very busy.